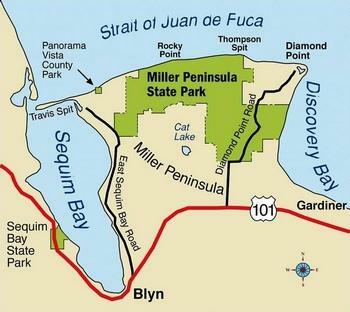 Diamond Point, located in the Sequim sunshine belt has just a quarter of the average rainfall than the rest of Western Washington. Maybe that is why in the early 1960's Helen and Howard Dent developed Sunshine Acres on 500 acres on the North Eastern tip of Miller Peninsula. 24 acres was set aside for the development of an airport; a 2335 foot runway with residential lots on the North property line, commercial and light industrial lots on the southern boundary, and several lots to the south for hangar development. Taxiway access was deeded to lots on several streets through direct access at the South West corner of the airport property and a North East taxiway providing access for two residential lots on Lupine Drive. Around 1997, Helen not having sold but a few of the lots bordering the southern boundary of the runway applied to the county to have 8 of them rezoned to Residential. Within a couple of years all were sold and 6 had homes built on them. Sunshine Acres Plat 3 Bldg. Sunshine Acres First Plat Bldg. We are located on the airfield, come in and visit! Have a seat, grab some coffee and let's talk. Diamond Point Airport was named from the waterfront settlement that from 1873 to 1933 served as a quarantine station for incoming ships sailing for Seattle.